Judy and Brad Niemeyer designed the layout, instructions, and foundation papers for the Queen size Lily Pond. 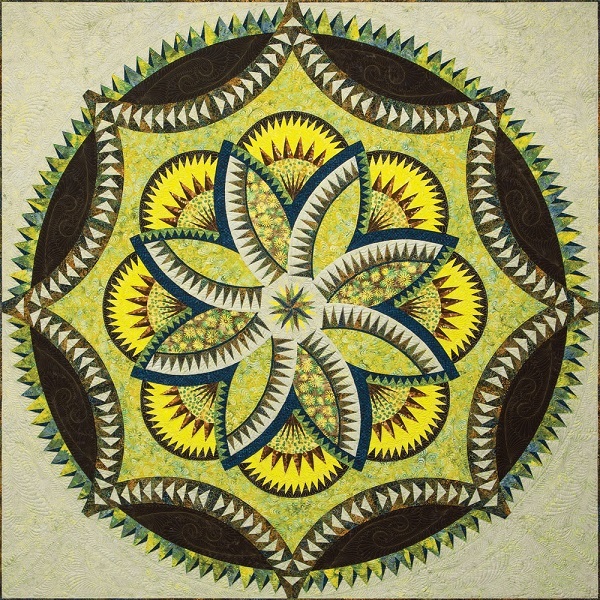 A collection of batiks designed by Judy and Judel Niemeyer with Timeless Treasures called Peacock were selected to make the sample shown on the cover. A sewing technique called foundation paper piecing is used to assemble the units required to make this quilt. Traditional piecing and curved piecing techniques are used to join the units after the foundation piecing is completed. 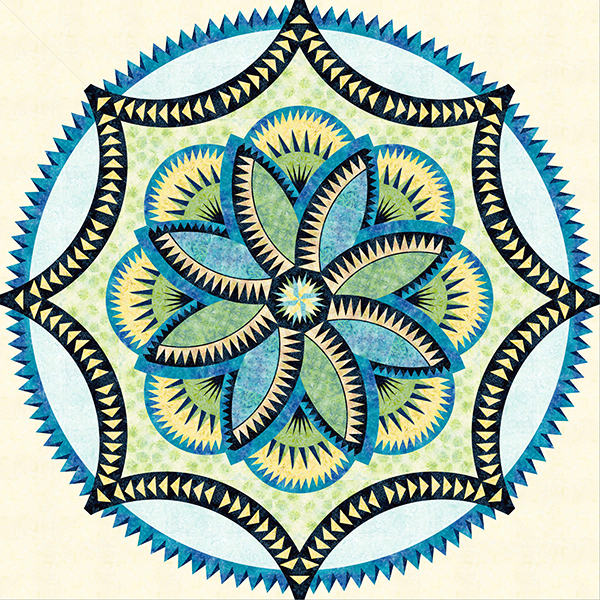 The color layout for the quilt on the cover was designed in Quiltster, a subscription-based fabric auditioning application that Quiltworx has been working with a design software development firm to bring to the Quilting Industry for the last two years. With Quiltster, you can load fabrics into spaces on a quilt design to see what it looks like before completed. 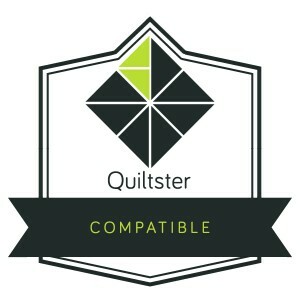 Quiltster is set to launch in 2016 to a consumer audience! 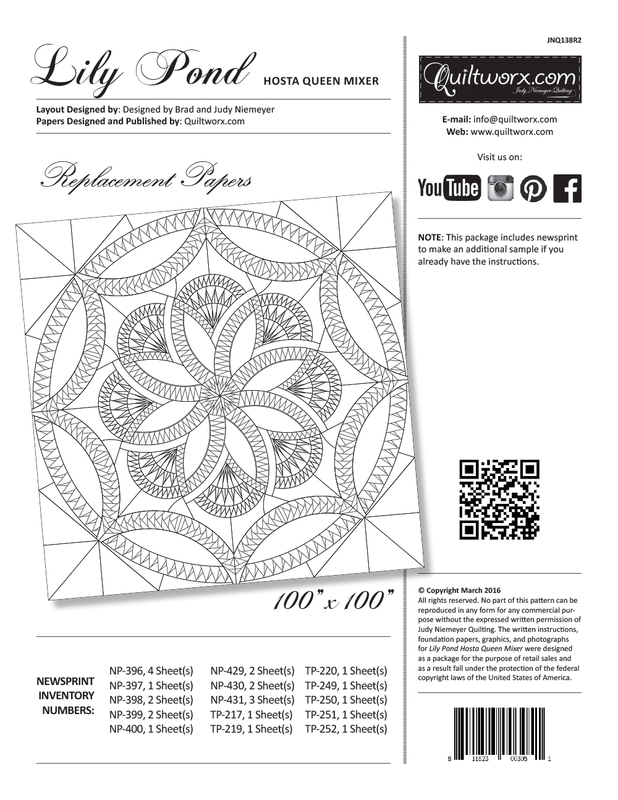 This pattern publication also marks the launch of a series of patterns using new units designed to fit the original Fire Island Hosta layout. 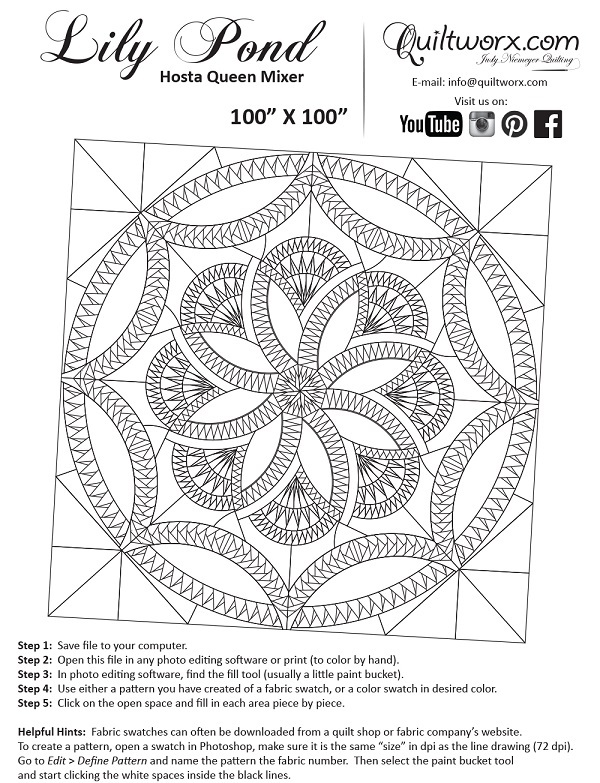 When all of these patterns are published, a customer can use Quiltster to mix and match units from each design to create their own unique quilt pattern! 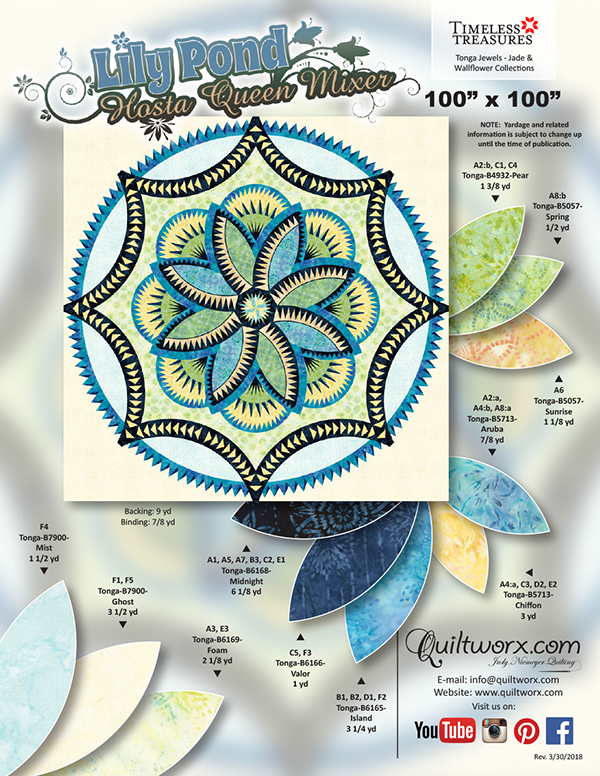 As a Quiltster subscriber, you will not only be able to try out fabrics, but mix and match the blocks between the Hosta layouts to create your own unique design! 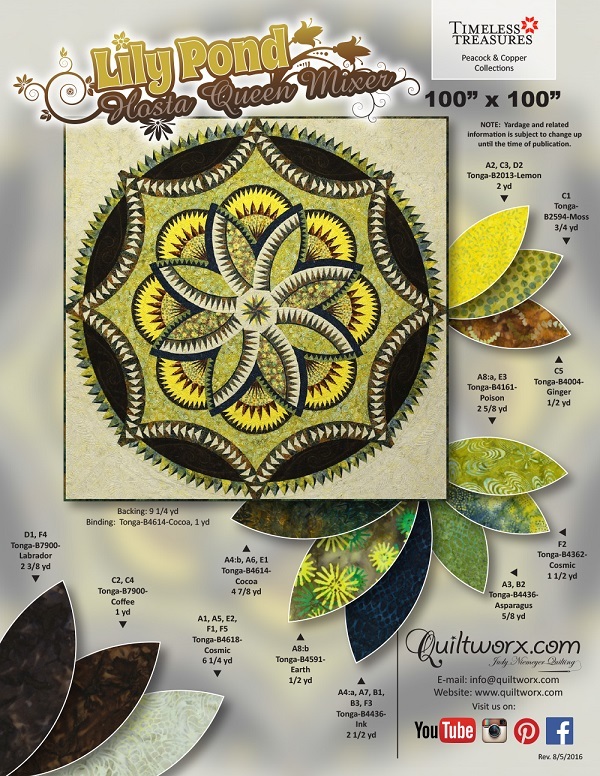 We are excited for the Quiltster launch and the upcoming release of many other elements to use with the Hosta Layouts. Mary M. Donahoe That is so beautiful, but if I worked on one these I wouldn’t have time to do anything else. Diana Lemieux Where are yours Ann!😍!! Mush Say its a beauty!!! Mary Sharp Uhhh, hello, have you lost it?? Or are you hooked?? It is gorgeous my crazy friend. Polly Mundell Beautiful fabrics and quilting!!!! Kathy Roloff Wow!!! Absolutely beautiful!! Doreen Mercure 💯very very pretty. Anna M Bowen Stunning quilt! Edna Katzenberger Trunt Tabbitha Niemi! Edna Katzenberger Trunt Is a kit available for this? Robin Flynn Kramer Julie Blair is janette selling this quilt? Patty Monroe Fowl This quilt is stunning!!! Love the pattern, the fabric choices and the quilting!!!! Kate Grant I saw this at Festival of Quilts - absolutely stunning. Charlotte De Vun DuBroc Beautiful work! Annette Knoop Kahrs Mary Mekelburg this IS gorgeous!!!! Carol Quance saw this at Festival of Quilts - absolutely stunning! Elaine Dworaczyk Are you kidding me? This is way too much... "gorgeousness". Love love color way. Chris Sisson I'm working on mine, using Tula Pink - it's gonna be gorgeous! Steve Di Schaeffer-Steel Love the colours, great job, could you tell us the which fabric range it is? Cathy Bremer This is one of the best Quiltworx I've ever seen. Patricia Olmstead Great choice of colors. Deb McGuire The whole center seems to float! Carol Felde What an amazing choice of fabrics! Jeffrey Banta You quilters are just totally amazing! Mary Lou Bowen That's lovely. Kay Briske-Cox THIS IS VERY NICE AND I ABSOLUTELY LOVE YOUR COLORS..
Nancy Kloster Phillip! I am not surprised at the beauty of your quilt ... you are very talented and have impeccable taste. Absolutely beautiful! Cheryl Martel That came out gorgeous Phillip. I'm sure you're happy it's done. Marcia Lee This is beautiful Phillip. Maudie Lang Love it. Colors are stunning together. Sally McMasters Love the vibrant colors!